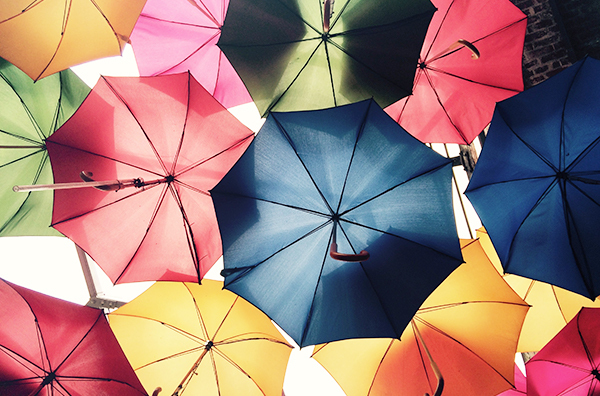 If you’re well prepared, volatility can provide a great opportunity to top-up at lower prices. While markets are calm it’s a perfect time to make sure you’re in the right strategy and frame of mind to take positive steps when market volatility returns. Here are 4 actions you can take when markets are boring to prepare for wilder times. This should be an obvious one but people tend to invest too much of their savings when markets are calm. Low volatility markets lull people into a false sense of security due to ‘recency bias’ but you should never invest money that you need for short term living expenses. Over the short run, market returns are far from guaranteed, any money you need in the next year should be kept in cash. Think about investing over a day or week like flipping a coin. On any day there’s about a 54% chance of the market rising and a 46% chance of the market falling. 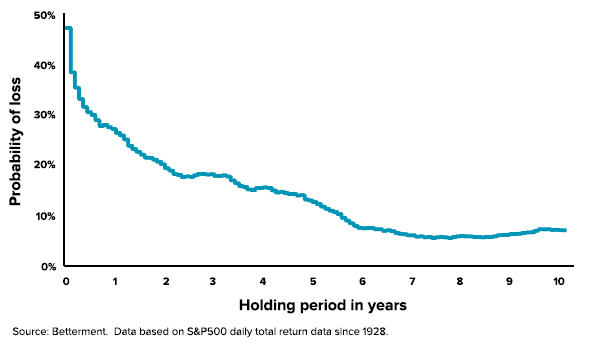 As you invest longer, the probability of making a loss declines and the odds of making a positive return move in your favour. The odds don’t really stack up until you’ve invested for 2 years when you have an 80% chance of being ahead. 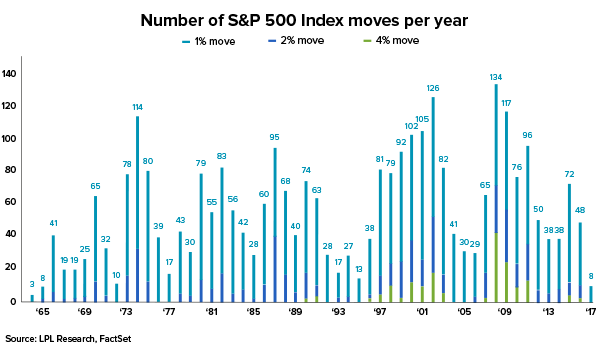 There’s a tendency when markets are calm to move into riskier investments – or change strategy into something generating higher returns. This is a form of ‘market timing’, the dangers of which become apparent when markets become less calm. The investment strategy you choose should reflect how comfortable you are with market falls and your investment timeframe. How calm or volatile the market currently is should have no impact your investment strategy as markets can change quickly and unexpectedly. For instance, we recommend our Topaz (growth) portfolio is best suited for clients looking to invest for at least 7 years. If your investment horizon is shorter, the other portfolios have more defensive investments and are more appropriate. The Topaz portfolio has historically produced higher returns but it can also have deeper falls when markets dip. The bonds and gold are likely to provide some cushion however anyone investing in the Topaz growth portfolio should be comfortable with a 20% market fall and be the sort of person who would stay invested if that happened. This is why time is important, it can take more than a year for the market to recover from a 20% correction. If you’re likely to get nervous if markets fall you are possibly more suited to our conservative portfolios (Amethyst, Sapphire and Turquoise). These portfolios are better for you if you have a shorter investment horizon or you’re not willing to accept significant dips to achieve a higher return. Nothing is set in stone so if your personal situation changes, don’t forget to update your investment profile in your investment dashboard. We’ll let you know if your current investment strategy is still right for you or suggest what changes should be made. If the market fell 10% next year could you take advantage of the lower prices to add to your portfolio? Having some cash set aside will help you dollar cost average and provide a psychological reassurance to protect your emotions if markets fall. If they do fall you can pat yourself on the back and buy more rather than be tempted to sell and run for the hills. We often talk about dollar cost averaging and one of the big benefits is being able to take advantage of lower prices when markets fall. Last but most importantly, be ready to ignore the market noise. As sure as night follows day you can be certain that when market volatility does return, commentators will get very excited and come up with all sorts of doomsday predictions. To be a successful investor you need to have the discipline to ignore the noisy commentary and let your portfolio continue to work for you in the background. There is an immense temptation to get caught the hype and sell when financial commentators are hysterical and markets are falling. Selling everything is never the right long term decision and will mean you miss the markets rising again. Provided you’re invested in a strategy that matches your investment horizon and risk capacity, you shouldn’t do anything when markets fall apart from let us rebalance your portfolio to keep your portfolio in shape. No one knows when the next period of market volatility will take place, but if you’re prepared for it you will be able to sleep easy knowing that you’re always heading towards your goals.